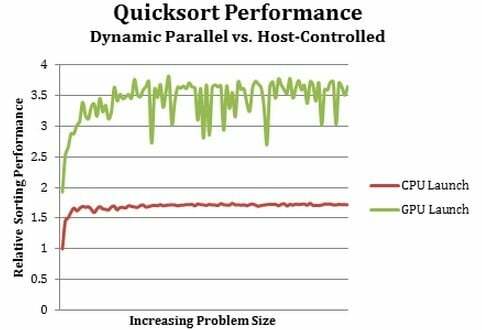 Back in May, when Nvidia divulged some of the new features of its top-end GK110 graphics chip, the company said that two new features of the GPU, Hyper-Q and Dynamic Parallelism, would help GPUs run more efficiently and without the CPU butting in all the time. Nvidia is now dribbling out some benchmark test results ahead of the GK110’s shipment later this year inside the Tesla K20 GPU coprocessor for servers. Does the speedup on CP2K perhaps have something to do with the fact that they are utilizing all 16 cores per node, rather than just 1? If CP2K is doing work on both the CPU and GPU, then these results are quite misleading. Another way of looking at this: they used 16 times the CPU resources to get a 2.5X speedup. Hi Brian, thank you for the question. 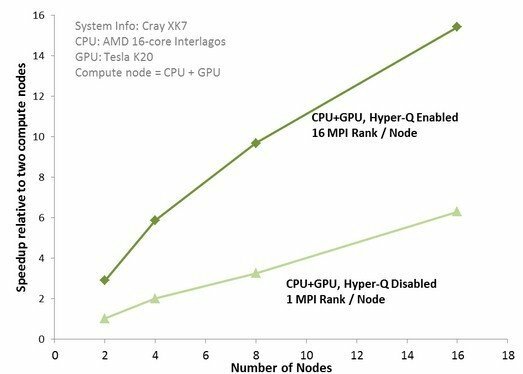 The performance using all 16 cores of each CPU without a GPU is comparable to using 1 core with 1 GPU per node, so the performance gain in this example is entirely attributable to the Hyper-Q technology.